Art, created by the expression of perception implemented through energy necessarily is the sequel of what comes before. Can the gifted artist design a miracle? Or is the more accurate frame to consider that the gifted artist might create something miraculous? And if there is validity to this latter premise, how does one go about creating the miraculous? In Search of the Miraculous or One Thing Leads to Another is legendary graphic designer Milton Glaser’s meditation on these questions. This volume explores the interdependency between art, energy, and miracles. Energy is the essential ingredient to stimulate and translate perception into art. The “miraculous” is possible only through consideration of its relationship to what comes before, thereby providing the necessary comparative context for something to appear miraculous. In the realm of visual arts, technological advances have both transformed the means and reinforced the ends. The work of Milton Glaser displayed in this volume reflects his application of the modernist’s technological tools of automated precision, replication, and control to achieve an effect mirroring the visual virtuosity of Impressionism, introduced in the last third of the 19th century and transformed in the first quarter of the 20th century by Claude Monet. Specifically, Milton Glaser presents an extraordinary body of work, whose execution individually, collectively, and cumulatively would have been unimaginable absent contemporary technology. This volume captures in book form both images and the author’s explanatory text of his 2010 exhibit at the American Institute of Graphic Arts. What came before that exhibit was the artist’s creation of the work displayed in the exhibit. What came before this book is his subsequent reflection on how one work of art relates to and leads to other work. Forward looking, future oriented creation explicitly, inevitably, and implicitly is informed by the past. To this end, Mr. Glaser observes, “It’s fascinating to discover that something you thought was a brand new idea actually had its root 35 years earlier.” Gifted creative people recognize this imperative; the great playwright Edward Albee observed that an artist aspiring to do great work had an obligation—to his audience, to his craft, to himself—to know the work that came before. Contextualizing to promote understanding, however, the author advances, “is usually done retrospectively after the artist’s death, but that seemed problematic.” Necessarily, implied in this premise is that the articulation of the works is provided by others, not by the artist. 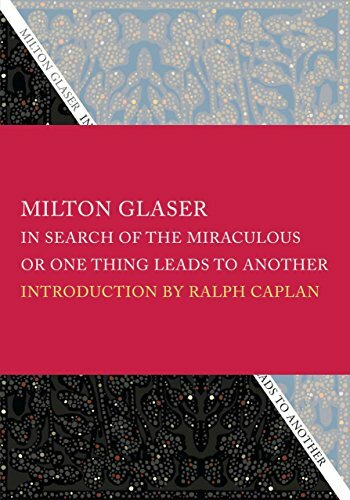 In In Search of the Miraculous or One Thing Leads to Another, Mr. Glaser proposes that this odyssey is provided when the author is alive and at the height of his game— much like Milton Glaser himself. Following an informative, insightful introduction by Ralph Caplan, the book’s presentation is organized in three parts. The main body of the book appears in the section that shares the book’s title. A second section—The Client Didn’t Get It—features work whose attributes were not recognized by the client, for as Milton Glaser observed, “Every designer has a closet full of proposals that were rejected by clients. In many cases they feel these are their most significant works.” The final section—Stumbling in the Dark—illuminates how the process of creative art often proceeds along a path that is not readily recognized, making missteps inevitable. The visual arts presented here encompass applications serving multiple purposes, produced in multiple mediums. What distinguishes the body of work that is the subject of this presentation is the combining, integrating, mixing up of portraits and patterns, texture and color, product labels and property signage, exteriors and interiors, the stark and the complex, environments to be experienced—e.g. interiors and rugs—and places to be observed. Massive wall murals employing text, image, color, scale, bright/brilliant/vibrant colors are contrasted with dark/subtle/nuanced distinctions. A rug in one context becomes background in another. Crisp portraiture elements are diffused into a fading, hardly discernible background element in a different visual image. One of the central issues of the role of graphic arts in the marketing process is the conflict between advertising featuring visual images that are derided but sell, and the advertising of visual images that may be claimed and win awards but do not ring the cash register. While this conflict is not specifically addressed in this book, the question is a fundamental subtext running throughout the presentation. For the marketer seeking visual arts that move the mind to action, and for the artist’s audience, by what is communicated in “the interval between looking and seeing,” this volume is illuminating, intriguing, and entertaining. Images dominate the words of In Search of the Miraculous and appropriately so, for a meditation on the role of visual arts is far more effectively conveyed by using examples of the medium itself, rather than an indirect literary narrative alone. In Search of the Miraculous aptly captures the tension involved in reconciling the artist’s aspirations to do great work and the client’s objectives. This book eloquently, articulately, and with great panache, and provocation, illuminates the extraordinary outcomes that emerge when the artistic process miraculously works.